Our Pedal-Powered Sound System is now available for rent! You may have seen it at our Soirée, at the Green Music Fest in Wicker Park, or perhaps at WTTW’s Celebration of Graduation in Tuley Park, powering both music and speeches. Customized – Want a larger, more sophisticated build-out? We can do that too. Contact us for pricing. The system is from the awesome people at Rock the Bike, based in Oakland Park, CA. All configurations listed above include a mixer, microphone, speaker stand(s) and a bunch of cool black cables to tie it all together. The client is responsible for pickup and drop off. There is no charge to pick up a day before your event and return the day after. Our pickup/drop off location is on the North Side of Chicago, in Andersonville. Delivery fee starts at $100. Security deposit, equal to one day’s rental fee, will be refunded upon return of equipment in original condition. 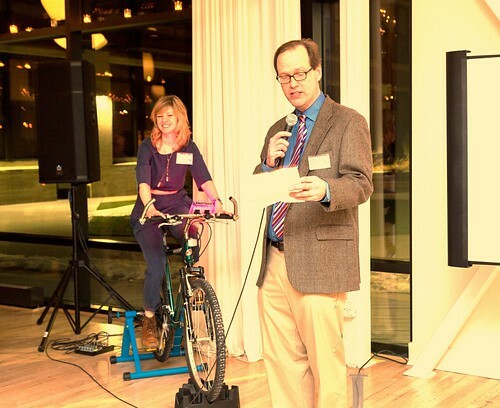 The first step to renting the equipment is to email Joey Feinstein at joey@climatecycle.org to see if we can accommodate your event date. Then, we will send you an estimate or invoice along with the Pedal-Powered Sound System Rental Agreement. We look forward to making your event unique, fun, and memorable — with sound powered by putting the foot to the pedal!